Trisha Velarmino has traveled Asia, Europe, Africa, Latin America, and the Middle East, and has now made Tel Aviv her home. 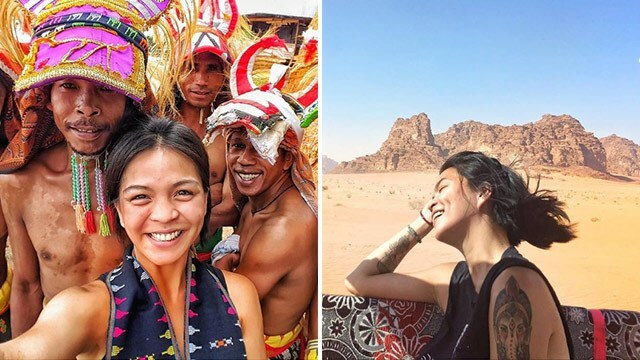 It’s one thing to spend a week or two sipping margaritas at a popular tourist destination; it’s another thing entirely to pack your bags, set off solo to a faraway country, and basically just wing it from there—which is what Pinay travel blogger Trisha Velarmino has done, and continues to do. Find out how she has made blogging her bread and butter, and how she scores side hustles to supplement her income. What made you decide to live as a world traveler instead of staying put in the Philippines? Seven years ago, I was fortunate enough to be accepted to a study abroad program in a fashion school in Italy. During my time there, I kept seeing people with huge backpacks wandering around the Duomo in Milan and I had the guts to ask them, “What are you guys? !” We ended up sitting in a cafe and exchanging stories. I told them about my cool life in fashion school where I got to attend Milan Fashion Week with backstage passes as an intern at Roberto Cavalli. When it was their turn to tell me about their lives, I felt less cool—they were hitchhiking from Serbia! They were already on their third week and hoped to reach France for a big gathering of backpackers. Growing up in the Philippines, I have always been coined “different,” not just because I don’t wear bras, but because of my radical views on things. For me, wearing a bra is uncomfortable and it is my right to choose however I want to live, but in a very conservative country like ours, somehow, I never felt I fit. I loved every bit of traveling around my own country, but being out here made me accept that I am different and that’s okay. It took me so many years to be okay with who I am and I found that freedom when I left to travel the world. When you are out here, it is so much easier to explore the many different versions of yourself and be it. Out here, I am me. What countries have you lived in, and how did you support yourself in these countries? I never really settled in one place until August 2016 when I moved to Tel Aviv. My way of traveling is very slow; I stay in one country or city for at least three months to learn how the people eat, cook, speak, and sleep. After my formative years in Italy, my first travel experience was in Morocco, where I was able to comprehend the deeper meaning of being alone and responsible for yourself. I had enough money at the time, but I soon found my life in a very humbling situation. My ex-boyfriend with whom I was then traveling in Africa woke up one day and said, “I need a break.” That “break” led me to go to Brazil even with nothing just because I didn’t want to go home. If I went home, people would say, “Ayan, sinabi na sayo eh! Hindi posible ‘yang gusto mong mangyari!” I didn’t want to hear that. Even if it was difficult for me financially, I decided to go to Sao Paulo and start over. I pushed myself to learn the basics of blogging. I was self-taught. I watched videos, read a lot of articles—day in, day out. While I was at it, I used Couchsurfing and met a lot of amazing people. I even stayed with one host for three months! Most of the people I’ve “couchsurfed” with are now my long-time friends. Starting a blog is difficult so while I wasn’t earning much from it yet, I taught English in Ecuador and Argentina, I worked at a hostel bar in Peru, I did a lot of house-sitting and Couchsurfing. I also did social media management and worked on translating files from Latin languages to English. Anything that I thought was possible for me to do, I did it. It was the only way I could sustain my life on the road until the blogging took off. What made you decide to pursue blogging full-time? I didn’t really think hard about content because I really loved writing. Writing, for me, is a collective of all our experiences. I wrote with honesty. I presented my true, authentic self. I wrote what made me happy, what made me scared. I’ve always believed every one of us has our individual truths and that is the beauty of writing—there is freedom. I am in total control of publishing. I don’t need to seek approval before it goes live. It might be hard to comprehend, but the bulk of my salary comes from the blog. It took me places, got me into free media trips, bought me plane tickets. It feels very fulfilling that I get to earn from my art. Besides the blog, what earning opportunities have you found for yourself? Millennials are very creative when it comes to finding a job, but we don’t always look at what is not offered. In LinkedIn, the job descriptions for hiring are very specific. But what if I don’t want that job? What if I can offer better services through what I know? In order to do this, I go to the company profile, find a problem or a department they are poorly maneuvering, and write a compelling pitch. Online pitches are very difficult and I won’t say I get a “yes” for every pitch, but keeping my eyes on the prize made me write pitches I never thought I could write. We live in an era where choices for young people like us are not limited. I met people who donate their hair to Chinese factories, girls who dance for a living so that a party would look cool. We can be whoever we want to be as long as we are happy about it. We need not stick to tradition because if we do, we will live a life of just getting by—and “just getting by” will eat us alive. How much do blogging and your side jobs earn you? For social media management, I earn up to $2,000 USD per month (approximately Php 99,000). I used to earn $500 USD (approximately Php 25,000) for a one-time translation. The only downside of these kinds of jobs is that they’re client- or campaign-based. They’re short-term. What I have for long-term is, of course, the blog where earnings can rise up to $9,000 USD (almost half a million pesos) per month. Now those might look like huge numbers, but only in the Philippines. I am currently based in one of the most expensive cities in the world and believe me, I feel like I have to take more projects and campaigns because it’s not enough to sustain it. Rent for a small apartment in Tel Aviv is already $1,000 USD (Php 45,000) not including bills. And when I am out of Tel Aviv, I also have to spend a lot of money. The bulk of my blog’s content is about travel and in order to produce valuable content, I need to travel. What are the financial challenges you encounter with your unique work setup? Income streams come from different places. I don’t just have one job—maybe I have five to six and the income is not always stable. For example, if I don’t work hard on the blog, I only get $100 per month; if I do, I can get $10,000. There is no stability unless I have long-term social media clients. But I am slowly starting to develop my own business to make this life more sustainable. It will take a while, but I am really excited about the challenges of growing up! What are your next steps and upcoming destinations? I just came back to Tel Aviv from a one-month road trip in Morocco, so I am still playing everything by ear. However, this year, I would like to be more involved in my personal endeavor on girls’ education and women’s rights. I want to go to Sierra Leone and Malawi to work on my campaigns. This is an unpaid job and flying to Africa is very expensive so I think I’ll step back a little, plan carefully, and think how I will be able to get this done. How long do you plan to continue living as a world traveler and travel blogger? I don’t know. The best thing that has happened to my life is how I’m able to take what’s in front of me. For now, this is what I have, so do I need to know? Life is disorderly. Life does not respect the timeline we make for ourselves because times change and we should respond to that change. We might not admit it consciously but we know there are a lot of things about life we cannot control. Whatever the results may be, I will always choose the path to happiness, no matter what. What advice do you have for Pinays who are looking to travel more but are worried about their finances? I can’t speak for everyone and I won’t tell you to JUST DO IT because we are different humans who lead different lives. Some of us have families to support; some of us have siblings to send to school. I can’t tell you what to do because that is your life. But what I can tell you is that the only decision that matters is yours. No matter what you do, don’t seek approval from other people because your strong feelings toward a certain thing are the more important thing to consider. Want some motivation? Watch Trisha’s TEDxCollegeofSaintBenilde Talk about growing up here.